2020 Democratic Candidates Focus On South Carolina And Its Diversity The state's large share of African-American Democratic voters and a well-timed spot on the 2020 primary calendar make it a critical state for presidential candidates. 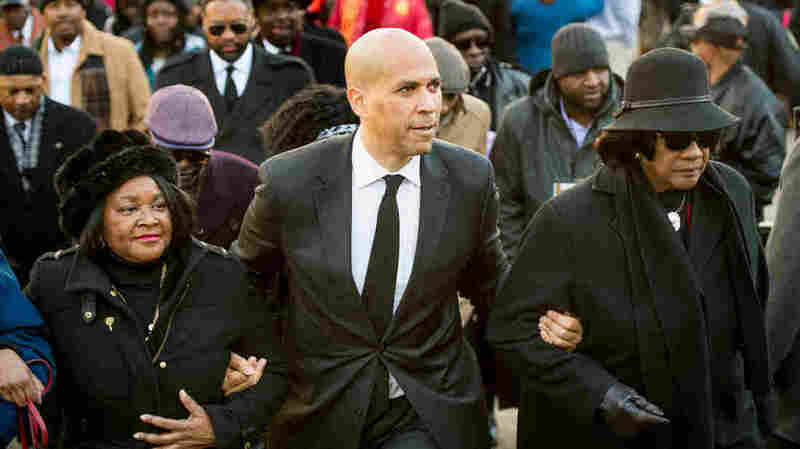 Sen. Cory Booker, D-N.J., attends the annual Martin Luther King Jr. Day at the Dome event on Jan. 21 in Columbia, S.C. Booker and many other Democratic presidential hopefuls have made visits to the state in the early weeks of the 2020 campaign. The Democratic Party is increasingly focused on and organized around diversity. It also has the most diverse field of candidates in the history of presidential politics. And voters in South Carolina, the first primary state with a predominantly African-American Democratic electorate, have been inundated with 2020 hopefuls in these early weeks of the campaign. Cory Booker and Bernie Sanders spent the Martin Luther King Jr. holiday with the South Carolina NAACP. Booker and Kirsten Gillibrand just made swings through the state over the last week. Kamala Harris and Elizabeth Warren will be there in a few days. All of this, as South Carolina will take on increased prominence in 2020 for another basic reason: the primary calendar. South Carolina's primary will fall on Saturday, Feb. 29, just three days before Super Tuesday, when nine states are expected to vote — most of them also in the South, with Democratic primaries largely determined by black voters. "Really, South Carolina becomes the gate to the rest of the South and other states with similar demographics," said South Carolina political operative Jaime Harrison, an associate chair at the Democratic National Committee who's exploring a run for Senate next year. "The person who comes out first or second in South Carolina, particularly since the field's so large, will really have a lot of momentum going into Super Tuesday." That's why Harris' campaign sees South Carolina as the key early state — even more important than the traditional starting blocks of Iowa and New Hampshire. It's so important to the California senator's strategy that Harris will make her second trip to South Carolina as a declared candidate before she even steps foot in New Hampshire. This week, Booker made his first official campaign appearances in the state. He purposely began in rural spots away from the voter-heavy population centers like Charleston and Columbia, drawing several hundred people to events where Booker leaned hard into retail politicking. He repeatedly broke the 90-minute mark speaking and answering questions, then would stay afterward so that every single voter who wanted to could speak to him, take a selfie, or even record videos alongside Booker to send to friends and family. Booker repeatedly circled back to the call for unity that he has launched his campaign around. "When are we going to see that the cancer on the soul of our country is the divisions that exist between us in a nation that's united?" he asked the crowd in Winnsboro, S.C. "That claims to be one nation under God? We need to put the 'indivisible' back in 'one nation under God.' "
The crowds were all predominantly African-American, and they often hung on every word as Booker delivered a stump speech tying his family's struggle to buy a house from racist real estate agents to iconic Civil Rights milestones like the 1965 Selma-to-Montgomery voting rights march. Booker and Harris don't show the same hesitance that Barack Obama displayed during his 2008 presidential run when it comes to speaking frequently and bluntly about racial issues and racial injustice. They, like many other Democratic presidential candidates, talk about racial sentencing disparities, police discrimination and other topics. "The Russians have made it very clear, if we weren't before – that the issue of race is America's Achilles' heel," Harris told the syndicated radio program The Breakfast Club this week, referring to Russian operatives' attempts to exploit racial fault lines during their 2016 disinformation efforts. "And it has now become an issue that is not only about civil rights, but also an issue that is about national security." With black voters holding so much influence in the South Carolina primary, Booker and Harris may be viewed as the favorites there. But voter after voter told NPR that race wouldn't be their sole deciding factor. "I think it's great that we have Cory and Kamala. However, I also think that it's really great for the Democratic Party that we have a tremendous group of people that are very intelligent, highly skilled," said Beverly Diane Frierson, who holds a leadership post in the Richland County Democratic Party. Harrison shares that view: "A lot of folks are very pragmatic. They're looking to see who's going to be a winner and who can champion my issues the best."